Overseeding is a six-week process taking place from mid-September through early November in which the courses are closed to play for 2-4 weeks. Overseeding involves drying out the bermudagrass and a grass scalping technique to make room for the ryegrass seed that will be laid over the top the older bermudagrass, hence the term “overseed”. Why change from Bermudagrass to winter grasses? In areas like Arizona, Las Vegas, North Carolina and other Southern Regions, Bermuda goes dormant during winter months due to the temperature change leaving golf courses little choice but to overseed. Even though the Bermudagrass won’t die completely, the dormant look leaves the courses browned-out and splotchy. Some courses overseed “wall to wall” which includes both fairways and rough while others overseed only the fairways. Let’s face it, golfers love playing on green grass! 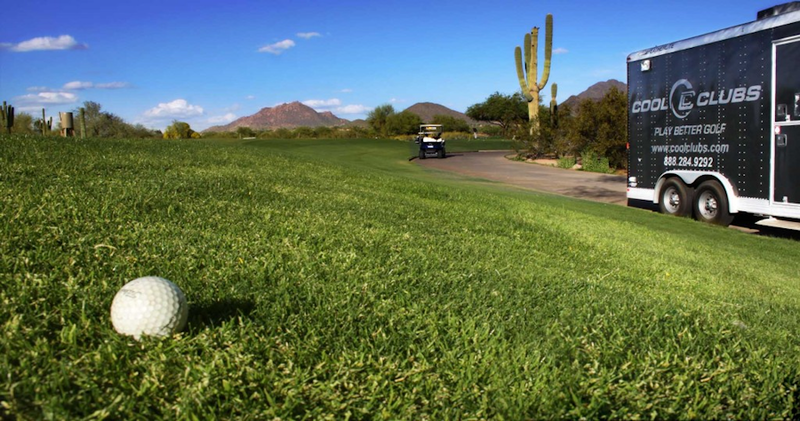 When the overseeding process is finished in the Greater Phoenix Area, Grayhawk’s Raptor Range will be open and Cool Clubs will begin our outdoor Tour Fitting season. What is the difference between an indoor Premier Fitting and an outdoor Tour Fitting with Cool Clubs? While both use the same equipment and software, indoor you hit off a synthetic mat and into a screen illustrating the track of the ball flight. Outdoor you hit off grass at the Raptor Range experiencing turf interaction and see the live ball flight. During each session our fitters will figure out which head and shaft combination optimizes your results so you can play better golf. Final adjustments are made in the club build shop so the head, shaft, grip, length, lie, loft, weight, and frequency are crafted to your exact specifications. The clubs are one of a kind and just for you. Give Cool Clubs a call to book your Tour Fitting today! Or, click the button link below. Indoors or outdoors? Just let us know your preference. Book your Cool Clubs fitting today.